This is one of my favorite recipe when I have ground meat on hand and want a meal thats warm, hearty and quick. There are a couple of processes involved, but with a little planning, this makes for a good weeknight meal. This time around I've used ground turkey for the meatballs, but I've also used, ground beef and chicken in the past and they work equally well. If I am using beef, I just add a tablespoon of Worcestershire sauce to the mix. These pictures are from when I was restricted to cooking in a kitchenette the size of a box, so if I can do it, you sure can. To make life a little easier, you can make the meatballs and the sauce ahead of time, if you'd like. Sometimes I fry up the meatballs and store them in the fridge for a few days till I'm ready to use them. They also make a great meatball sub. 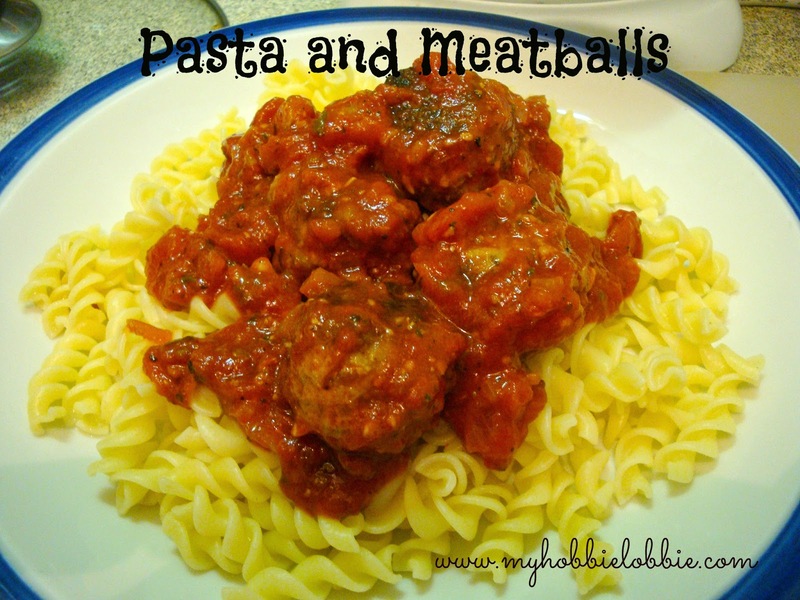 Here's how I make this recipe - I start on the sauce and while the sauce is simmering, I prep the meatballs and grate the cheese. When I'm frying up the meatballs, I boil the pasta alongside. At times, I've had all three happening at the same time as well. Just make sure you keep an eye on everything. I usually serve this with a nice fresh salad and at times some garlic bread, and that for me is the perfect meal, or atleast it makes me a very happy camper. Another thing worth noting, is that while the the sauce and meatballs sitting over a bed of pasta might make a prettier picture, I would recommend stirring the sauce through the pasta before serving up. And its not just me, I was reading up someplace and a lot of people vouch for the fact that the meal is more flavourful when you toss the pasta and sauce together before serving. If you don't have ground meat at hand, cocktail sausages / frankfurters cut into little slices also do the job. Precooked (grilled or roasted) chicken and shredded, works nicely too. I love how versatile this recipe is. Heat a pan with a tablespoon of vegetable oil. Fry the meatballs till they are golden brown. NOTE: You may need to fry the meatballs in batches. Add more oil to the pan between batches as needed. Place a saucepan over medium heat and pour in the olive oil. Tip in the chopped garlic and saute for a few seconds till nice and fragrant. You do not want the garlic to burn. Add the onion and fry off till the onions have softened. Add the capsicum and stir fry for a couple of minutes. Add the herbs and spices and stir well . Add salt to taste. Bring to a boil. I add about 1/4 can of water (use the tomato can to measure and swirl it around to use up all the rest of the tomato sauce) and add as needed, to give you the desired consistency. Let it come to a boil again. Cover and let the sauce simmer for about 10-15 minutes on low heat. The flavour in the sauce deepens with simmering. Add the meatballs / chopped up sausages / shredded chicken. Gently stir and let it simmer till everything has warmed through. While the sauce is simmering, boil your pasta according to the package instructions. Add the sauce to the cooked and drained pasta gradually, depending on how much sauce you like with your pasta. Toss well and plate up. Grate some parmesan cheese over the top and serve. If I have any sauce leftover, I use it as a base sauce for pizza. You could also use it to make some meatball subs. Yummm! Delicious and lovely looking pasta with meatballs.Also thanks for the idea of using remaining sauce for pizza.